The Zeta metroid is the most versatile of all metroid evolutions. During the last molting, the Zeta metroid has fully sprouted a pair of legs, as well as developed primitive arms, which end in two fully functional claws. 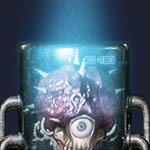 The Zeta metroid stands at a height of 3 meters tall. Its head has developed to a more ovular shape, allowing it to perform more complex actions within its brain. With the ovular shape, its eye clusters are now on the sides of its head, allowing it to see in more directions at once. With the increased brain functioning, it has also been able to develop a crude type of language, consisting of everything from barks, growls, howls, and screams. The Zeta metroid, like it's predecessors, adopts hard outer carapaces to protect itself. In this molting, the Zeta metroid has also gained a tail. With its addition to legs it also has increased leg power allowing it to run at speeds of up to 30 mph. It uses its newfound tail to balance itself like a ship rudder when running at these horrific speeds. 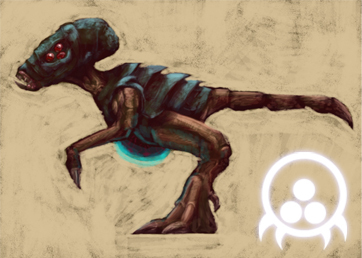 The Zeta also has a developed maw, consisting of a jaw and two rows of teeth, averaging 1-2 inches in length. The Zeta has also been noted to give a jaw crushing capacity of 1-ton p/s/i (per square inch). The most terrifying thing about the Zeta is the fact that it can generate small bursts of heat out towards its prey. The source of this and how the Zeta accomplishes this is still unknown to scientists. Also remarked is the ability for the Zeta to shoot small burst of air from its carapace shell, giving it the ability to levitate. 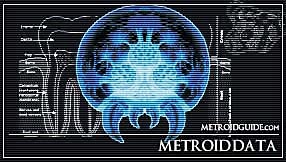 As far as scientist have been able to suffice, the Zeta is the final stage in metroid evolution. From here on, all other metroid evolutions are unknown why they happen.